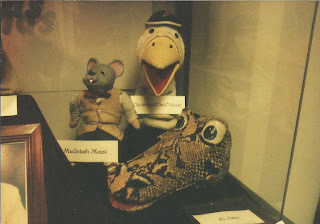 I took this photo at the MUSEUM OF BROADCAST in Chicago before it moved a few times. It was located in the South loop for a while and I visited a few times. This Ali Gator puppet was on display with the GARFIELD GOOSE & FRIENDS puppets BUT disappeared when it moved into the Cultural Center and not sure what the story is behind it. Roy Brown was the puppeteer for the classic Chicago kid's TV show.